Happy Valentine’s Day! I hope all you happy couples out there enjoy some nice chocolate treats and peaceful alone time. In honor of this very special day, I thought I’d write a love letter. No, not to a significant other (I’m very much a single pringle) or even an in-game NPC (because I wouldn’t put it past myself to do that). NO. 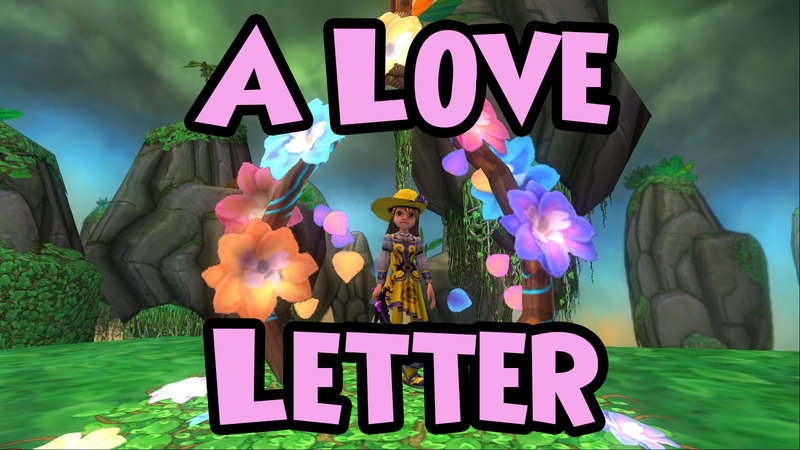 I’m writing a love letter to something that’s always very close to my heart … the KingsIsle community. This one’s to all of you. It’s been a long journey. We came together 5 years ago, in 2013, when I started playing Wizard101. I was immediately amazed by your welcoming spirit and endless patience. Coming into a new game can be overwhelming, but you helped me through it. You showed me various game resources that I still use today, offered help when I needed it most, and gave me advice that would carry me through the years. In the process, we’ve shared numerous laughs and smiles. On my darkest days, it’s like you knew exactly what I needed. Like in any relationship, we have our moments. Cringeworthy decisions, disappointing outcomes, and the occasional drama. But we get through it. Nobody’s perfect, but overall, the good outweighs the bad. We learn from the bad experiences anyway. Or at least try to. That’s why I forgive you when you slip up, and I hope you do the same for me. You’ve changed a lot since we first met, but I think that’s neither a good or bad thing. It’s just a natural progression. Change is a necessary step in incorporating new people and new ideas. It brings some freshness into our relationship. That doesn’t mean I don’t miss the ones who’ve moved on though. I hope someday I can run into some old friends and catch them up on everything that’s happened. After all, who doesn’t love a trip down memory lane? Perhaps the biggest change in our relationship has been me. Through your many wise mentors, influential thoughts, and encouragement, I think I’ve turned into (what I hope) is a better person. You’ve challenged me creatively, professionally, and personally, and I’ve developed because of it. That’s why, years from now when I don’t even know what my life will look like, I will still view our relationship as a defining moment. One that will never be forgotten or taken for granted. I can only hope that our relationship will last for many more years to come, and with it, even more memories.